As part of our new paint correction service we are likely to be doing more of a technique called wet sanding. 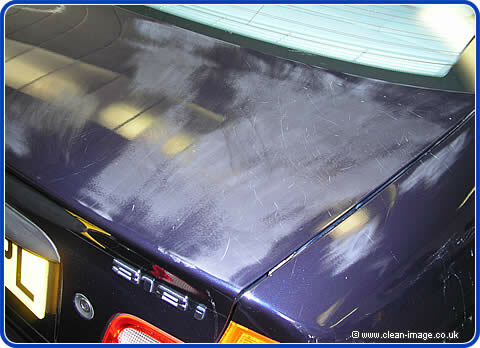 Most people haven't heard of wet sanding, it's a technique for reducing scratches and etching from bird droppings on car paintwork. Note that I say 'reduce', because as yet there is no magic answer to fixing this kind of damage (although we are working on it). Sometimes we can completely remove scratches and etching with this method, other times we can only improve it -- it all depends on how deep the damage is. Wet sanding involves removing about 0.5-1.0 mils of Clear Coat from your car with 2000 grit glass paper, this doesn't sound much but your paintwork is probably between 3.5 and 6.5 mils thick in total. 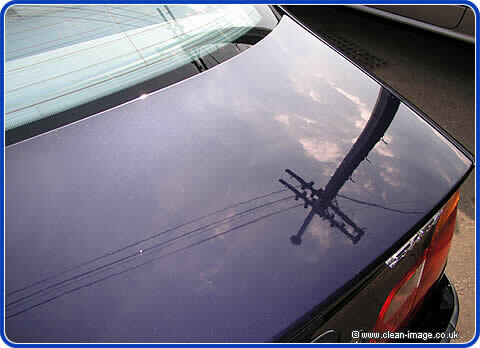 (The paintwork is made up of a primer, a metallic base coat and then a lacquer called 'clear coat'). The scratches in the photos on this page were caused by a lady placing her handbag on the car every day. Because the bag wasn't placed on the car with any great force most of the scratches are broad but shallow, (although they were fairly deep in places). So they are a lot worse than they look, this is exactly the kind of scratch that we can often remove completely. However, buffing alone will not remove all of them, what would happen is the buffing pad wouldn't get as much purchase on the flat undamaged paintwork, but would get more purchase on the damaged scratches. The result would be the buffing would polish the scratches so they were shiny, but would actually make them deeper so you would end up with a dip where the scratches were. 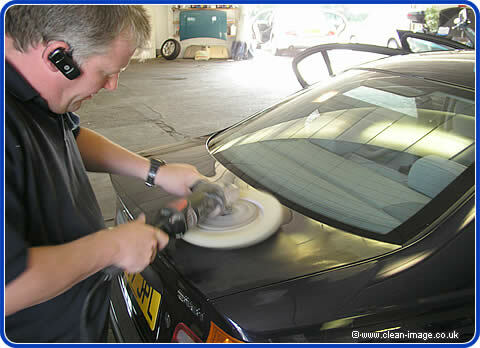 And as you have polished them and made them shiny they will reflect the light and be very noticeable! The fix for this problem is to prepare the surface by using some sandpaper to 'damage' the whole area down to the same level. This BMW is a high value car so it's worth spending the money on it to keep it up at it's maximum potential value, so it would be worth having the boot resprayed. This scratch damage actually extends onto the top of the rear wing which would mean having two panels painted... but it's still worth doing on a car of this value. This would come to around £250-£350. But in this case we were able to carry out paintwork correction involving wet sanding and buffing for which we charged £75 per panel. On this particular car we only charged for one panel because there was only a fraction of the rear wing that needed doing. This is a significant saving on having the car resprayed and has the bonus of leaving the original factory finish paintwork which is always tougher and harder than replacement paint (and it's an exact colour match!). 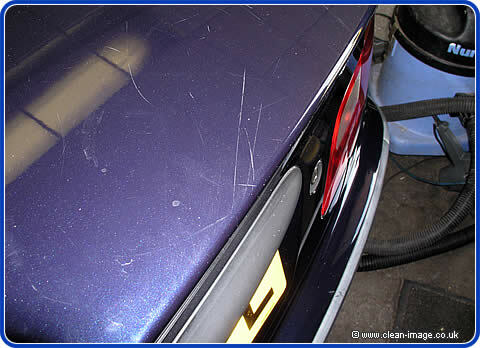 The paintwork is inspected to ensure it is original and has not been resprayed or buffed before. It's also examined for dents which can throw a serious spanner in the works. Using a fairly large sanding block and 2000 grit paper we sanded areas where the scratches were. Only the lightest pressure is used and progress is checked constantly to ensure that we are not going to deep. This kind of work requires a large amount of confidence and experience, however it helps to know that we are fully insured and have accounts with two of the best body shops in the area. In case you are wondering if we ever have accidents doing this kind of work, yes we have on occasion! However, our customers are made aware of the risk and we are usually talking about panels that are already damaged and would be repainted anyway if we were not able to fix them. 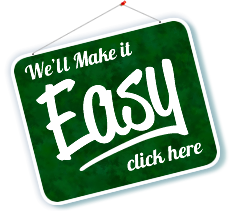 We give customers the choice. Normally we are very careful and take no risks, but if you have a panel and were going to have it repainted anyway, then we can go that little bit further, and it's at this point where we often find we have performed miracles! The jobs which are difficult and involve risk are usually those that are close to the edges of a panel or highly contoured areas. 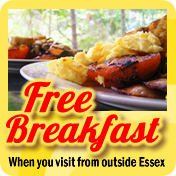 Flat areas like the boot on this page and the bonnet on the next involve minimal risk. After this paint preparation we then buff the panel with a wool pad and medium compound, then finish with a polishing pad - in this case, unlike the cars in many of our other articles, we did not polish the car to the nth degree for two reasons, firstly because making the boot too shiny would make the rest of the car look dull, and secondly because some light scratches remained (the broad scratches visible in the photos vanished, it was the smaller deeper scratches that remained) and the shiner you make a panel the more it shows up imperfections. So we buffed the car just enough so that it looked right. 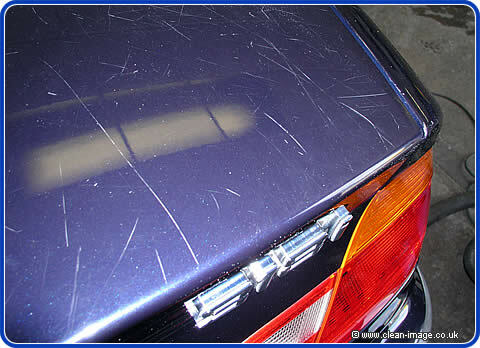 Of the scratches that did remain, the wet sanding much reduced them and the buffing rounded off the edges (so that they are more of a dip than a 'V' cut into the paint) so that they don't catch the light, in fact they ended up no more noticeable than the slight scratches found on most cars of this age. As you can see, you wouldn't now give this panel a second glance and you have to really look to see any damage, in fact it's safe to say it was now the best panel on the car. Video Article: "Don't worry, it'll polish out"
We scratch up a bonnet, and then re-finish half of it.